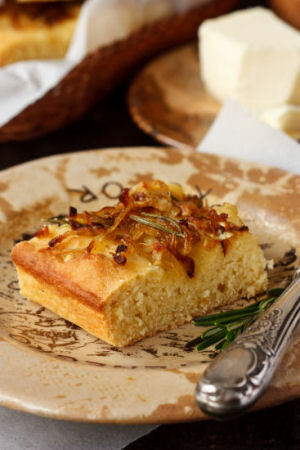 Focaccia may be topped with herbs or other ingredients. Popular in its homeland of Italy, it's simply seasoned with olive oil, salt and herbs. You may also find it topped with onions, garlic, black olives and even cheese. Focaccia with Rosemary is a popular focaccia served with antipasto or any number of appetizers or simply as a bread or snack. Follow this recipe and you will undoubtedly have an authentic Focaccia and a delicious one to boot. Si molto bene! 1 cup, onions, sliced very thin---sautéed in 2 Tbsp. of the oil below and a pinch of the salt until very lightly golden in color---do this while the dough is raising! Dissolve the yeast in the warm water in the bowl you intend to mix the dough in, add sugar and 1/2 the flour. Mix smooth with a fork or spoon/spatula and scrape down the sides of the bowl. Cover with plastic wrap and let sit 3 hours at room temperature---about 70 degrees F.
You're ready to mix, so add the remaining flour, the olive and canola oil and the salt. Mix until dough for 10 minutes, using a low speed! Don't cheat, really do 10 minutes! Allow dough to rise once until fully doubled in volume or a bit more! I leave mine right in the mixing bowl! When it has risen, turn it out on to a floured surface, cut in it half and roll out each piece into a rectangular shape, a little smaller than the baking pans. Lightly oil (about 1 Tbsp.) 2 - 11 x 17 baking sheets. Using your fingers and the palms of your hand, press the dough out to the edges of each pan. Combine sautéed onions, chopped garlic, olive oil, rosemary and pepper. Top each pressed in dough with an equal amount of the topping---use it all. Cover loosely with plastic wrap and let it rise for 45 minutes. Allow it to rise, covered. Sprinkle on the kosher salt and then bake in your preheated oven for 30 minutes. Remove and let cool for 2 minutes and then turn the focaccia out on to wire racks to cool.